Let pain and stress melt away with the soft hot or cold gel therapy wrap. The long, reusable hot cold pack is incredibly versatile and contours comfortably to neck, shoulder, back, arm or leg. 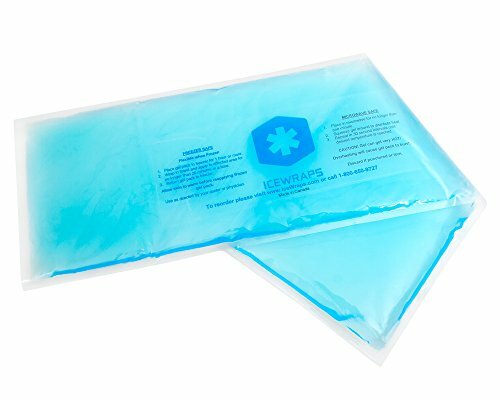 The large ice pack stays soft and pliable when frozen and double as hot pack when heated. The visible gel filling and tight plastic seal ensures a worry-free and leak-free experience. Our gel packs are non-toxic, low profile and more durable than other hot cold pack brands. Make sure to add IceWraps' soft ice gel pack as a part of your wellness routine. - Cold compress for joint and muscle pain relief, cooling neck wrap, shoulder wrap, back, hip, thigh, or knee. - Cooling wrap, cooler safe, keep food and medication chilled, and more. - Heating pad / Hot pack to relieve tension, knots, joint pain, stiffness, muscle cramps, or bruises. - Place in freezer for ice pack. Gel stays flexible when frozen. Gel will freeze hard below -12 degrees Fahrenheit. Let it thaw for a few seconds to soften. - Place in microwave for 30 seconds at a time for hot pack. - Hot or cold therapeutic treatment up to 20 minutes. - Gel is 97% Canadian spring water. Case is made from high density 3mil plastic. - No ink is printed on the outside our gel packs; the label insert "floats" inside the gel case. IceWraps' reusable gel pack will last for years, but you should not overheat in microwave or leave in direct sunlight as this will shorten its effectiveness. External use only. We take pride in our outstanding customer service. Please get in touch with us for any questions or concerns. THIN BY DESIGN - These innovative gel packs maintain their therapeutic temperature longer than traditional packs. Therefore they are designed to be lightweight, thinner and more comfortable, with just enough gel to maximize coverage and flexibility. No more hard and bulky ice packs. The low-profile gel packs are designed to contour the neck, shoulders, back, and leg. Made in Canada. CONVENIENT - Store in refrigerator or freezer. Hot pack microwavable as a heating pad. Retain heat to warm up muscles and joints, soothe way aches and pain. NOTE: Gel will freeze hard below -12 degrees Fahrenheit. Let it thaw for a few seconds to soften and apply as needed. MULTI-PURPOSE - Extra long ice pack wrap perfect for the cooler, chill medications, cooling pad, shoulder ice wrap, knee ice wrap, as well as a neck hot therapy wrap, abdomen, hip, thigh or back heating pad. VERSATILE AND ESSENTIAL - Our gel ice pack comfortably contours to any body part. A must-have gel ice packs for first aid, essential for home or clinical use. Recommended by physical therapist, athletic trainers to treat joint or soft tissue injuries. ICEWRAPS is committed to your satisfaction and stands by its 1 year warranty against any quality issues. If you have any questions about this product by IceWraps, contact us by completing and submitting the form below. If you are looking for a specif part number, please include it with your message.